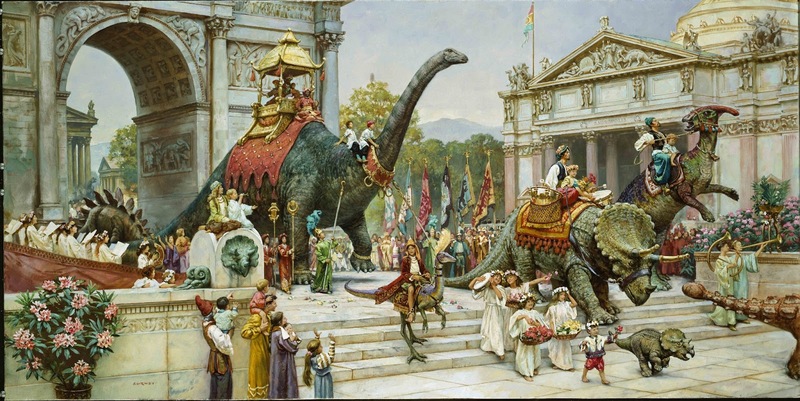 Artist and author James Gurney will exhibit 22 exquisite paintings from his Dinotopia series of books starting Wednesday, Feb. 20 through Wednesday, Mar. 13, 2013. Don’t miss this opportunity to see his work. The show will be at the New Hampshire Institute of Art. The exhibit is free and open to the public. 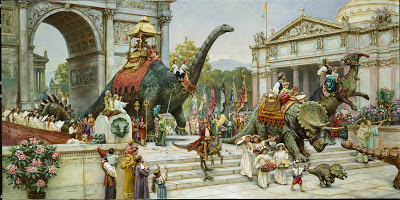 MANCHESTER–Breathe deep, seek peace, Dinotopia fans, and don’t miss Norman Rockwell Museum’s traveling exhibition Dinotopia: The Fantastical Art of James Gurney exhibited by the New Hampshire Institute of Art. The exhibition will run from Wednesday, Feb. 20 through Wednesday, Mar. 13, 2013. The exhibit is free and open to the public. Celebrate the opening of this exciting exhibit on Wednesday, Feb. 20 at 5 pm followed by James Gurney’s lecture: Worldbuilding: How to Develop a Fantasy Universe at 7:00 pm. The opening is free and open to the public. Gurney’s lecture is part of the Institute’s Distinguished American Artists Discussing Art lecture series and the cost to attend is $20. From the soothing, restorative environment of Waterfall City to the hidden wonders of Chandara, acclaimed author and illustrator James Gurney’s magical Dinotopian world comes to life in this enchanting exhibition that features 22 original paintings from the best-selling illustrated books Dinotopia: A Land Apart From Time (1992), Dinotopia: The World Beneath (1995), and Dinotopia: Journey to Chandara (2007), and presents fascinating examples of the illustrator’s creative process, including reference materials, and a handmade scale-model. The Dinotopia storyline chronicles the adventures and remarkable experiences of Professor Arthur Denison and his son Will on Dinotopia, a mysterious “lost” island inhabited by dinosaurs and shipwrecked travelers. The faraway land of Dinotopia― wholly the product of Gurney’s fertile imagination, scientific knowledge and meticulous artistic ability―is a civilization like no other. The society has its own language, alphabet (dinosaur footprints that correspond to each letter of the Roman alphabet), colorful festivals and parades. The lively cast of characters includes the inquisitive Professor Denison; Will and Sylvia, the adventurous young Skybax riders-in-training; the devious curmudgeon Lee Crabb; the beautiful musician Oriana Nascava; and a multilingual, diplomatic Protoceratops named Bix. James Gurney lives with his family in New York State’s Hudson Valley. He was born on June 14, 1958, in Glendale, California. As a young boy, he found it difficult to find books on dinosaurs, a subject that always captivated him. A childhood museum visit provided his first encounter with the skeleton of a formidable Allosaurus, leading him to imagine the dinosaur skeletons “stepping off of their platforms and tip-toeing through the hallways at night,” returning to their post by daybreak. Gurney’s youthful daydreams inspired an interest in archaeology and lost civilizations. The artist recalls many hours spent excavating his suburban backyard for arrowheads and “even a lost temple.” During college he majored in anthropology at the University of California at Berkeley, where he received a B.A. in 1979 with Phi Beta Kappa honors. From there he went on to pursue his lifelong interest in art, studying illustration at the Art Center College of Design in Pasadena, where he met his wife Jeanette, also an artist, who shared his love for sketching outdoors. A cross-country trip with friend and fellow artist Thomas Kinkade resulted in The Artist’s Guide to Sketching (1982). During his early career he painted jungle and volcano backdrops for animator Ralph Bakshi’s Fire and Ice(1983) and became interested in the fantasy genre. His art soon appeared on the covers of science fiction and fantasy novels but his big break as an illustrator came from National Geographic magazine with a series of challenging assignments working with scientists and historians to recreate ancient worlds. Gurney’s secret dream was to discover a lost city as significant as Troy or Machu Picchu and so, in his spare time, he envisioned and painted Waterfall City and Dinosaur Parade, which inspired the conceptual framework for Dinotopia. 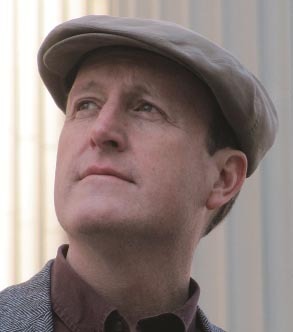 His first Dinotopia book, the New York Times bestseller Dinotopia: A Land Apart From Time, appeared in 18 languages in more than 30 countries and sold two million copies. Gurney has written and illustrated three other volumes in the series, Dinotopia: The World Beneath, Dinotopia: First Flight, and Dinotopia: Journey To Chandara. In 2002, Hallmark Entertainment produced a lavish $86 million television miniseries for ABC-TV based on the Dinotopia books that received record-setting ratings and an Emmy award for best visual effects. Founded in 1969, Norman Rockwell Museum is dedicated to education and art appreciation inspired by the enduring legacy of one of America’s greatest artists. The Museum houses the world’s largest and most significant collection of original Rockwell art, and presents the works of contemporary and past masters of illustration. The Norman Rockwell Archive contains more than 200,000 photographs, letters, and other ephemera. In 2008, the Museum was awarded the National Humanities Medal, which honors individuals or institutions whose work has deepened the nation’s understanding of the humanities. The Museum is located in Stockbridge, MA, where Rockwell spent the last 25 years of his life. In 1993, the Museum moved from its original home at the Old Corner House on Stockbridge’s Main Street to its present location, a 36-acre site overlooking the Housatonic River Valley. Architect Robert A. M. Stern designed the Museum gallery building. About the NH Institute of Art: Established in 1898 as the Manchester Institute of Arts and Sciences, the New Hampshire Institute of Art has had a firm commitment to educating diverse traditional and nontraditional students in the fine arts. The Institute offers a Bachelor of Fine Arts degree drawing undergraduate students from across the United States and Canada. Its Certificate Programs and a Continuing Education program attract and engage community members from throughout New England. Dedicated faculty promote intellectual and artistic development and teach students to respond artistically to contemporary social, political, and aesthetic issues. The New Hampshire Institute of Art is accredited by the National Association of Schools of Art and Design and the New England Association of Schools and Colleges. The mission of the Sharon Arts Center is to engage the community in the artistic process, to support and serve artists and craftspeople, and to foster the relationship between artists and the community through education, exhibitions, and the promotion and sale of arts and crafts as well as through special programs and events. The Sharon Arts center offers a wide variety of art classes and programs in the school facility in Sharon, NH. Great blog Armand! Any chance the Dinotopia exhibit will come thru S.F.? Ken, I would love to see that happen, but we don't have anything lined up for the Bay Area yet.